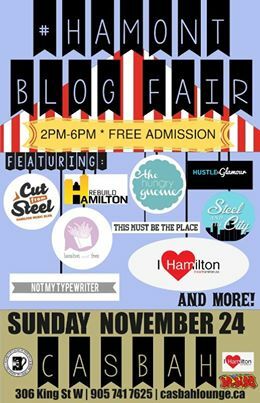 This Sunday at the #HamOnt Blog Fair, Rebuild Hamilton buttons will be for sale. All proceeds will be going to the Welcome Inn Community Centre Food Bank. Buttons will be $2 each or two for $3 (or whatever you want to donate). Non-perishable food items will also be accepted. If you do not have anything to donate, you can always grab a button for free. 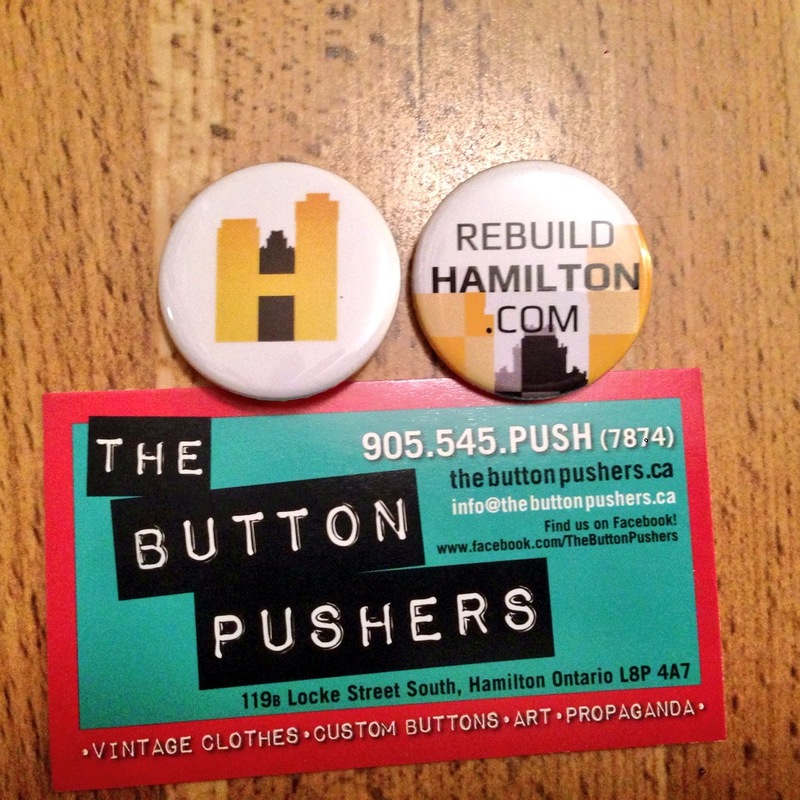 Special thanks to The Button Pushers for the fantastic buttons. 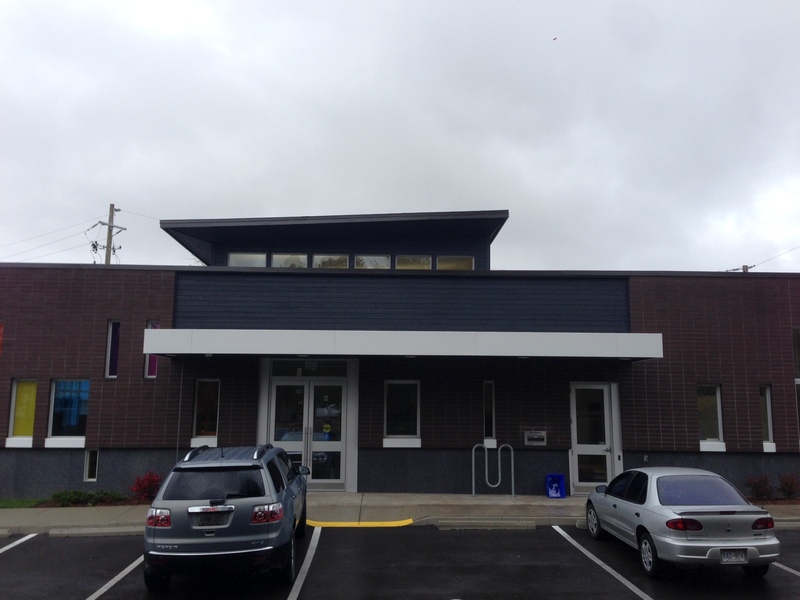 Nestled in the quaint hamlet of Lynden is the recently finished Hamilton Public Library, Lynden Branch. Set back from the road, the single-storey, 4,000 square foot library employs two distinct contexts of both rural and urban building design. 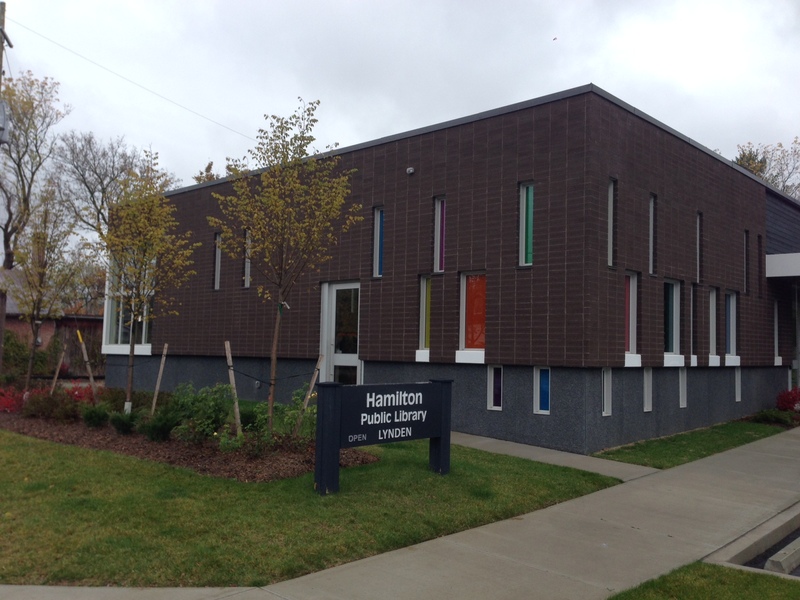 The exterior of the building consists primarily of a brown brick veneer, a look that integrates well with the library’s surroundings. Punched individual windows and large corner windows give a noticeable touch to the building’s exterior. Above the covered entrance of the library are shaded and ventilated upper clerestory windows that provide the atrium with ample natural lighting. 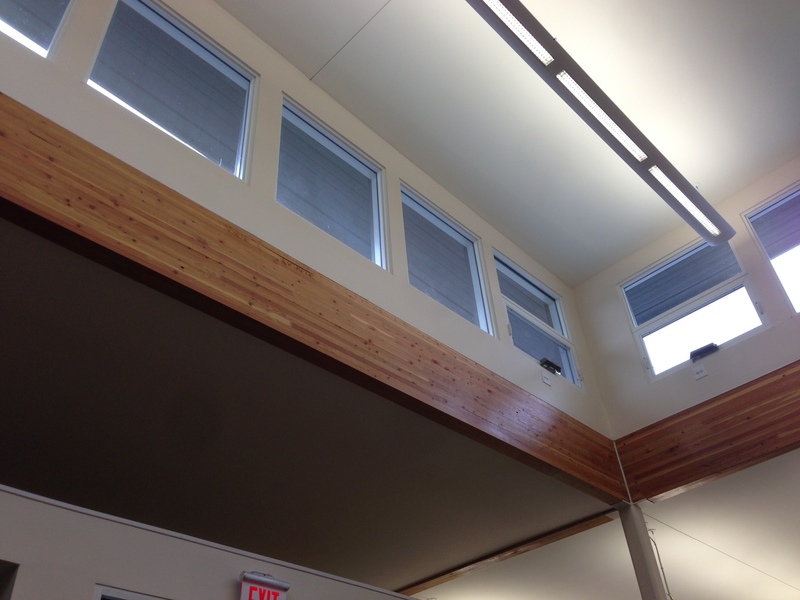 Inside the library, exposed glulam beams compliment the upper clerestory windows, giving the space a warm, rustic feel. 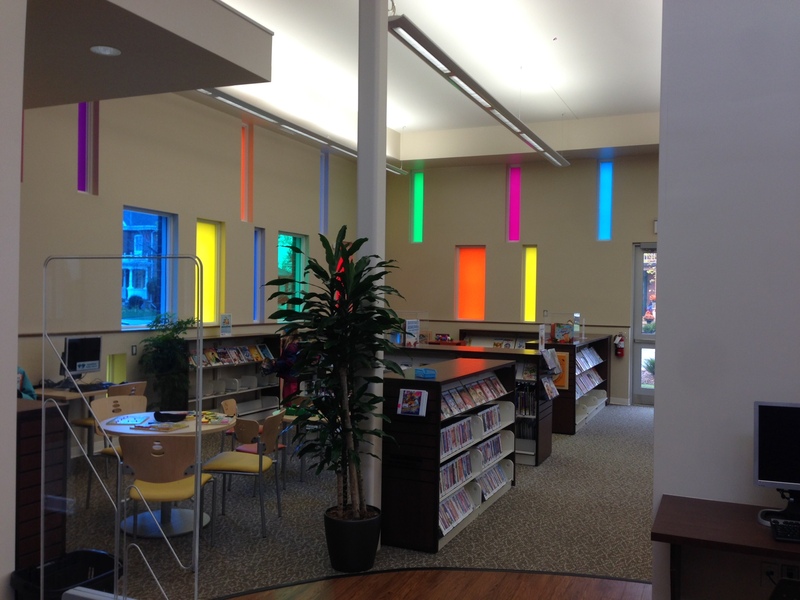 The children’s corner has punched windows at varying levels with colourful tints that add liveliness to the area. 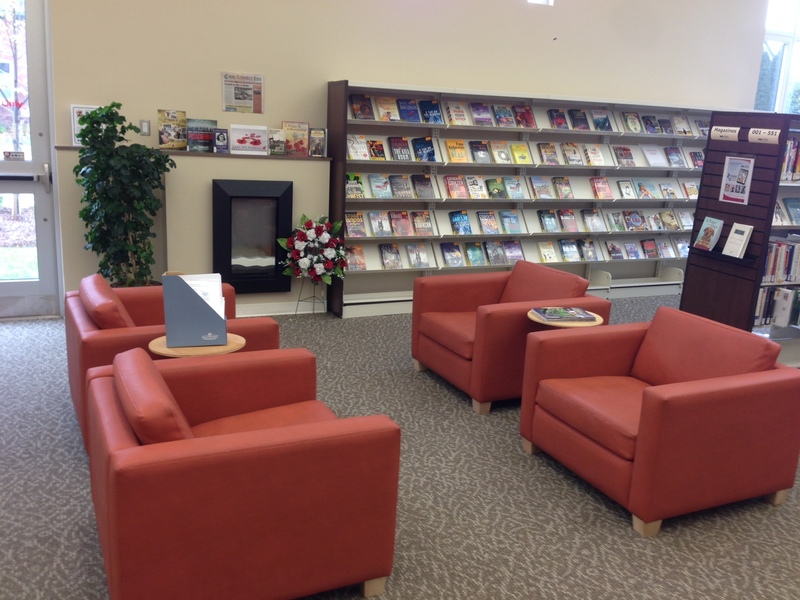 Next to the children’s corner is a casual seating area where parents can watch their children or read in comfort. The large open floor of the library allows for more social interaction, as well as better visibility for staff and patrons. The library also has a Teen Room equipped with computers, a smaller room for meetings, and a sufficient stock of books. 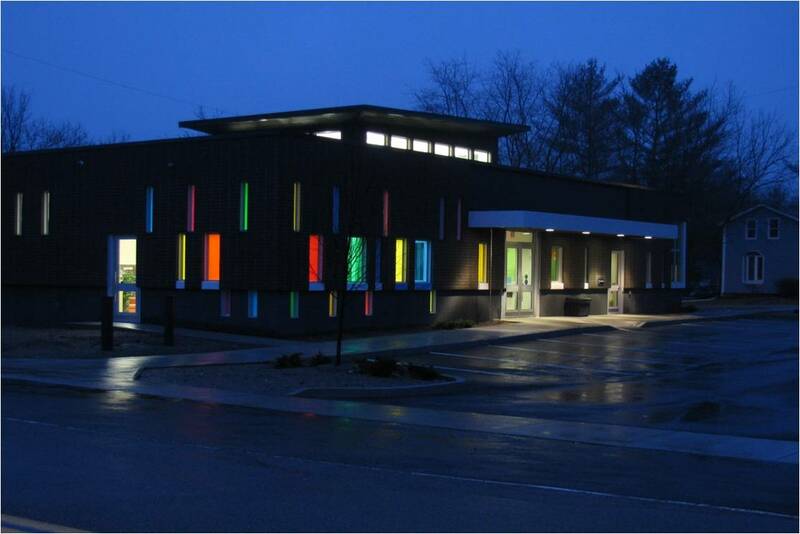 The library has a long list of sustainability features including an energy savings of over 35% than required by the Ontario Building Code. To reduce the light power output, occupancy sensors control the lighting. Many components of the building’s structure, including the brick veneer, contain recycled materials.